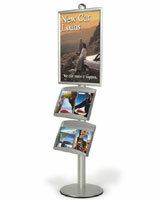 Snap Frames : This literature sign stand features snap-open moulding to make adding graphics easy! BRAVA Literature Sign Stand: 24" x 36"
A double sided signage display like this BRAVA literature sign stand may be just what you need to advertise indoors! 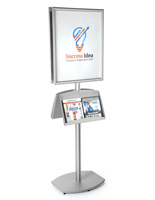 Comprised of a 6ft metal pole on a large, sturdy base, the literature sign stand holds two 24" x 36" sign frames and two steel brochure holders. Attaching one of each accessory to either side, you can place the sign holder display in the center of a busy mall or store exhibit. 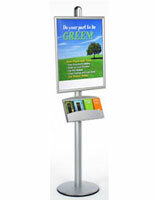 Double sided brochure stands like this literature sign stand reach more people because they can market your product or service from all angles! The literature stands will also be hard to miss because of their great height and unique style! Each of the aluminum sign holders on the metal pole are snap frames. 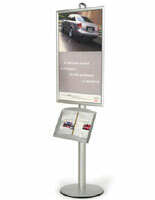 This type of sign holder is one of our most popular poster frames because it is so easy to load your signs. 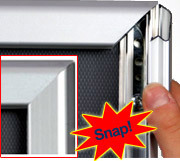 Simply snap open the four sides, place in your signage and the lexan overlay, and clip the sides down to close. The literature sign stand contains two of these sign frames, both which include a lexan non-glare cover to protect and keep your signs. 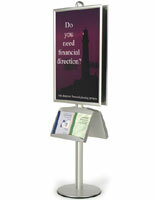 In addition to sign holders, the BRAVA literature sign stands also incorporate brochure holders that accommodate two stacks of 8.5" x 11" brochures, pamphlets, or other literature, side-by-side. 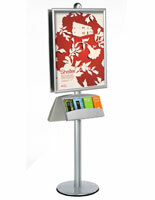 These literature displays can also hold one stack of extra large brochures or magazines. Each of the brochure displays is fabricated from heavy duty steel which is silver to match the aluminum pole, base, and frames. The pockets on the literature stands are also powder coated to prevent scratching or peeling. Many of our designer brochure stands and poster displays, including this BRAVA literature sign stand, are large and effective while maintaining style and sophistication. Based on European designs, these sign stands are upscale products that make the best presentation for your product or service. 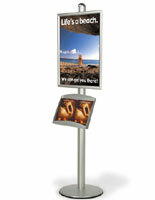 Attaching the sign holders and brochure trays to the BRAVA floor frame stand is quick and easy. First, slide the connector plates down along the pole's groove until it is where you'd like it. Tighten and you are done! 25.5" x 72.0" x 17.0"